This week, Mango's new-in section is filled with pieces you can feel proud to add to your shopping basket, as its first sustainable collection, Committed, just dropped. 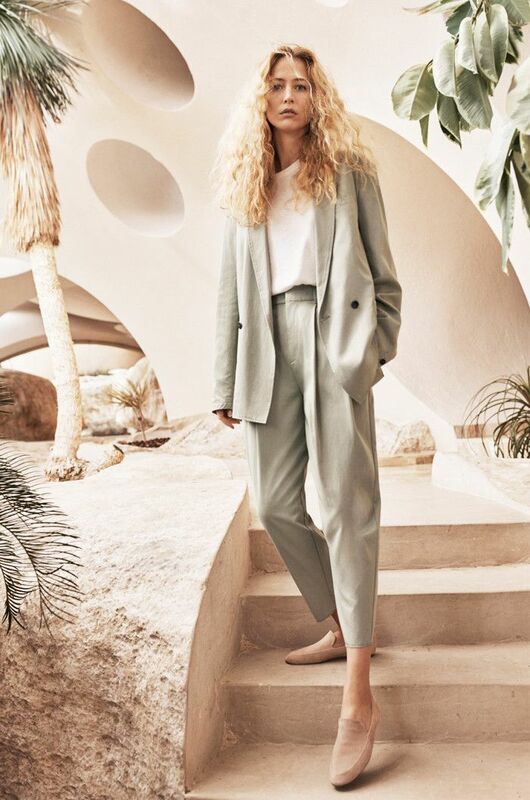 Mango has quite literally gone green, as the key colour in the ethical collection is a muted sage, with flowing sleeved midi dresses, sleeveless waistcoats and cotton slouchy suits in the earthy tone. These are the clothes we dream of wearing on holiday, as the yellow pegged trousers, basket handbags, wide-leg palazzo trousers, white linen dresses and buttery leather moccasins are all made to be worn near a beach. The entire collection of womenswear and menswear includes 45 minimal pieces. Each piece is made using environmentally friendly fabrics, such as recycled cotton, polyester and Tencel, and they are dyed using environmentally responsible inks. The pieces are manufactured in Portugal, Turkey and Morocco, and they all have certificates guaranteeing their sustainability. Ethical fashion is taking huge leaps, with a number of cool brands prioritising responsible production. Emma Watson has decided that every outfit she wears on the red carpet will be environmentally friendly, and she uses Instagram to shout about the best ethical brands. If you're reading this, Emma, you might want to have a click through the gallery below. Scroll below to shop Mango's sustainable collection below. For more ethical brands, see Emma Watson's stylish guide to shopping sustainably.